The St. Peter of Alcantara Parish Church (Filipino: Simbahan ng Parokya ni San Pedro Alcantara), designated as the Diocesan Shrine of Nuestra Señora de los Dolores de Turumba, is a Roman Catholic church in Pakil, Laguna, Philippines. It enshrines the Our Lady of Turumba painting. The first Catholic community in Pakil was organized by Fray Pedro Bautista (later canonized as San Pedro de Bautista) as a visita of Paete in 1588. It was separated from Paete in 1676. Father Francisco de Barajas, a priest from Santa Ana de Sapa Church in Manila, was named as the first parish priest in May 12, 1676. The first church was constructed of bamboo, nipa and other light materials, by volunteers under the patronage of Peter of Alcantara. In 1684, the government, through Governor General Gabriel Curuscalegui, approved the collection of a tribute for five years for the sole purpose of constructing a stone church. The foundation was laid in 1732 during the term of Father Fernando Haro, but it burned down in 1739. It was begun again, and the construction of the church finished in 1767 with the addition of a tower in 1777. The image of Our Lady of Turumba was unveiled in 1788. In 1840, Father Joaquin de Coria repaired the church, but because of a fire in 1851 which ravaged most of the town, Father Juan de Llanera fixed the damages to the church the following year. Father Juan de Dios de Villayos rebuilt the church roof and bell tower after it was damaged by an earthquake in 1881, and the church was rebuilt again in 1883 by Father Paulino Camba. Damaged by the earthquake of 1937, it was repaired again by Father Federico Diaz Pines with the help of the Confederation of United Catholics (Kapisanang Unidad Catolica). During World War II, the church suffered damage and was later renovated. A major repair was done from 1980 to 1984, when a story of the bell tower was rebuilt and the ceiling was renovated under the Parish Council of the Laity. The Chancery of the Roman Catholic Diocese of San Pablo confirmed that the diocese received a letter from Santos Cardinal Abril, Archpriest of the Papal Basilica of St. Mary Major in Rome. The letter conferred a Spiritual Bond of Affinity between the basilica and the church of Pakil. The church forms a cruciform and has a measurement of 162 by 36 feet (49 by 11 m). It is constructed in the Corinthian and Ionic architectural orders. Its facade has classical Corinthian columns and cornices across a floral stone relief. The church's side entrance is elaborately designed which is typical of churches in Laguna. To one side of the facade is a belfry housing four small bells and one huge bell. The main retablo is painted in white and has a pantheon of 14 saints housed in an elaborately carved niche with the Archangel Michael towering above. There are two smaller retablos on either side. Father Ronald Reagan constructed an altar marble consecrated by Archbishop Alejandro Olalia in 1959 where the image of the Nuestra Señora de los Dolores was enshrined. A pulpit and a large painting depicting the concept of Heaven, Earth, Hell, and Judicium Finale (Final Judgement), created by Jose Dans, a 19th-century artist from Paete, can also be found. A life-sized figure of a crucified Christ is found in a smaller retablo near the church entrance. The church's Stations of the Cross were made by local artists. Inside the church, there are original century-old images and church ornaments. Adjoining the church are a convent, sacristy, adoration room/chapel, and an ecclesiastical museum in honor of the Our Lady of Turumba. The museum contains clothes, perfumes, jewelry, and other historic memorabilia. The original oil painting, found by fishermen, can also be found inside the chapel. The Nuestra Señora de los Dolores de Turumba (Our Lady of Sorrows of Turumba) is a 9 by 11 inches (23 by 28 cm) oil on canvas painting of the Virgin Mary. It is a replica of Nuestra Señora de las Antiguas, which was found by fishermen on September 15, 1788 after a storm. It was found floating in Laguna de Bay on the bank of the Matamig River and its presence began the devotion of Our Lady by the church. The Turumba Festival in honor of the Our Lady of Sorrows is the "largest and longest religious celebration in the country". It consists of seven Turumba novenas, or lupi, for seven months commemorating the seven sorrows of the Virgin Mary. Pakil church served as filming location for the ABS-CBN television series Juan dela Cruz starring Coco Martin and the show's follow-up series My Little Juan. In 1983, the celebration of Turumba was immortalized in a film by Kidlat Tahimik. ^ a b "Pakil - Diocese of San Pablo". The Roman Catholic Diocese of San Pablo. 3 May 2014. Archived from the original on 3 May 2014. ^ "General Reshuffle: Diocese of San Pablo". The Roman Catholic Diocese of San Pablo. Archived from the original on 3 May 2014. Retrieved 3 May 2014. ^ a b c d Alba, Reinerio. "Falling for Turumba". The National Commission for Culture and the Arts. Archived from the original on 3 May 2014. Retrieved 3 May 2014. ^ a b "Turumba gets Santa Maria Maggiore grant". CBCP News. Media Office of Catholic Bishops Conference of the Philippines. August 6, 2014. Retrieved August 7, 2014. ^ Alhborn, Richard (1960). 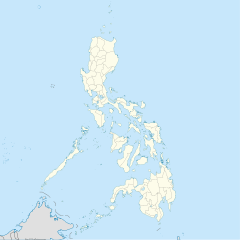 "The Spanish Churches of Central Luzon (I)". Philippine Studies. Ateneo de Manila University. 8 (4): 812. ^ Cuartero, Nestor (March 2, 2014). "Churches south of Manila you can visit on Holy Week". Manilla Bulletin. Retrieved October 18, 2014. ^ Giron, Tita (March 20, 2005). "A scenic way to do the traditional 'Via Crucis'". Philippine Daily Inquirer. ^ a b "Pakil - Palarong Pambansa 2014". Retrieved 3 May 2014. Huerta, Felix de (1865). Estado geográfico, topográfico, estadístico, histórico-religioso [Geographical, topographical, statistical, historical and religious state] (in Spanish). Binondo: Imprenta de M. Sanchez y Ca. Historical Markers: Regions I-IV and CAR (in Filipino). Manila: National Historical Institute (Philippines). 1993. p. 88. ISBN 9715380611. Santoro, Nicholas (2011). Mary In Our Life: Atlas of the Names and Titles of Mary, the Mother of Jesus, and their Place in Marian Devotion. pp. 350–351. ISBN 978-1-4620-4021-6. This page was last edited on 2 May 2018, at 06:54 (UTC).